Leslie Helm added fascinating tidbits of historical information beginning with his great-grandfather Julius leaving farm work in Germany (and, as the family joke goes, escaping an arranged marriage) to try his luck in Minnesota where he was soon disheartened, then he missed a boat to China and took the next ship out—to Japan. Leslie had Julius Helms’s autobiography to work from, but did plenty of research and interviews with remaining family and friends to weave facts and imaginings of how it was for a burly German man to break cultural barriers by marrying a Japanese woman and raising “mixed bloods” in insular Japan. The story reminds me of Lisa See’s On Gold Mountain epic of her Chinese and American family. Helms brings to life history and the delicate dance of living through WWI (Julius Helm had taught samurai the German fighting techniques) and WWII and the Occupation as German/Japanese with the American enemy mixed in. He takes us through the flames of hell rising from the Great Kanto Earthquake of 1923. He muses about the complexities of father-son relationships through generations. Those interested in genealogy will thrill to walk beside him as he discovers and follows clues that solve mysteries of family heritage. With all this to hold readers fast, Helms really drives deep with the main storyline—his and American wife Marie’s adoption of two Japanese orphans. I found this international adoption journey to be startling, painful, and raw as Leslie opens his heart to readers with his own misgivings, confusion, pain, and discovery. Adoption in Japan is no easy thing, both legally and emotionally, and add to that parents who do not look or act Japanese. I advise those who want to write their life stories to read plenty of memoirs, particularly those that hold similar stories. 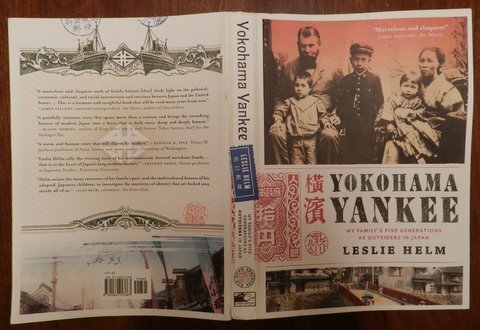 I bring up Yokohama Yankee and On Gold Mountain because adding genealogy and history can be a daunting task with so many different stories that need to be integrated into one. Reading other memoirs will give you ideas of how to organize and write your own, what to include—or not. Farewell to Manzanar helped me write Cherry Blossoms in Twilight. I liked the simplicity and the added historical details and that it was about the memories of being a little girl living a WWII experience few outsiders knew about. Other than that, these memoirs are not very similar. Yokohama Yankee is a 5-star book for me. Not only was it exciting to follow Leslie Helm’s discoveries of his family history and learn about Japanese and world history at the same time, the physical book itself is a work of art. Book designer Joshua Powell is a JET (Japan Exchange & Teaching program) alum and his time in Japan probably influenced his sense of aesthetics. He used Helms’s collection of old photos, postcards, and ephemera to turn the book into a visual delight. This entry was posted in adoption, book reviews, book talk, heritage, history, memoir writing, multicultural and tagged book talk, culture and heritage, family history. Bookmark the permalink.